– Execute accent figures in any place in the measure. – Play accents in any desired position combined with double stroke rolls. – Orchestrate all your ideas in more creative ways around the kit. – Improvise with much more freedom, both in your choice of rhythms and orchestrations on the kit. 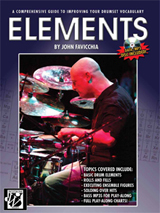 – Use the Elements to create more variety in your drum fills. – Be able to recognize and execute any given ensemble figure encountered on a chart. – Solo around the hits while playing with a band, no matter where the hits fall. A separate section deals with using the Elements to increase your four-limb independence while grooving. Also included is a MP3/data disc that is jam-packed with music to assist you in learning how to apply the Elements. There are 20 play-along bass track loops in nearly every style from rock to Latin, along with 8 complete play-along tracks-from easy to very advanced- that contain all the musical context in which to practice applying the Elements in grooves, fills, ensemble figures, and solos. As an added bonus, note-for-note transcriptions from Favicchia’s Dharma CD are included, illustrating exactly how the author applies these concepts in his own exciting style of drumming.